Clearance items include discontinued and returned products. All sales on clearance items are final. Search below for great deals and help us clean out the warehouse! Discontinued from regular inventory. 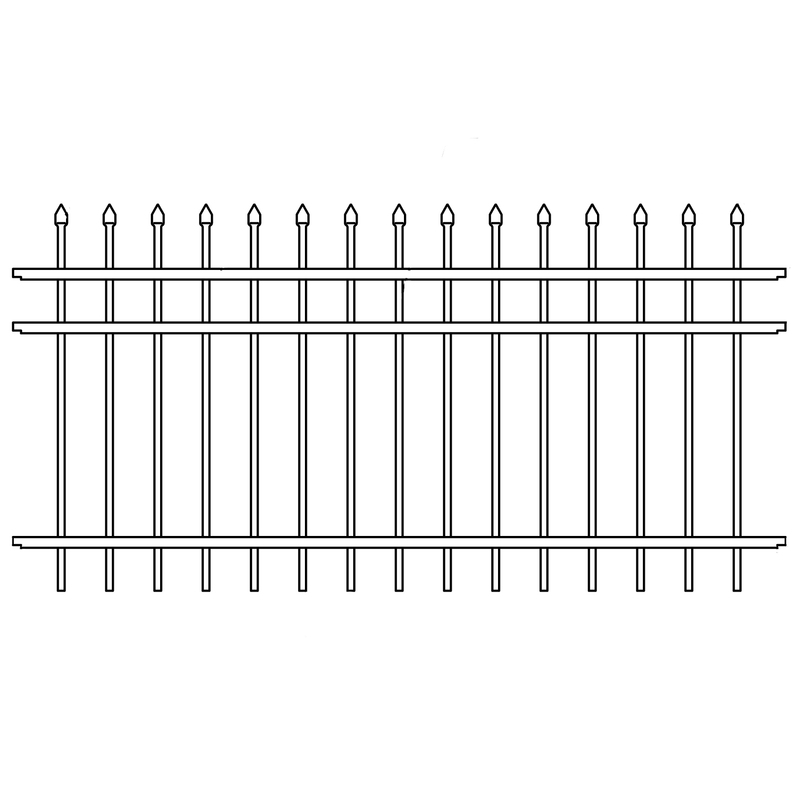 4ft Tall x 8ft Wide Economy style iron fence panel with pinch tip pickets instead of welded on finials. Features 2 horizontal rails. Fence hardware and steel posts not included, but are available for purchase. Matching walk gates in 4ft, 5ft, and 6ft single widths as well as 8ft, 10ft and 12ft double widths available as well. Discontinued from regular inventory. 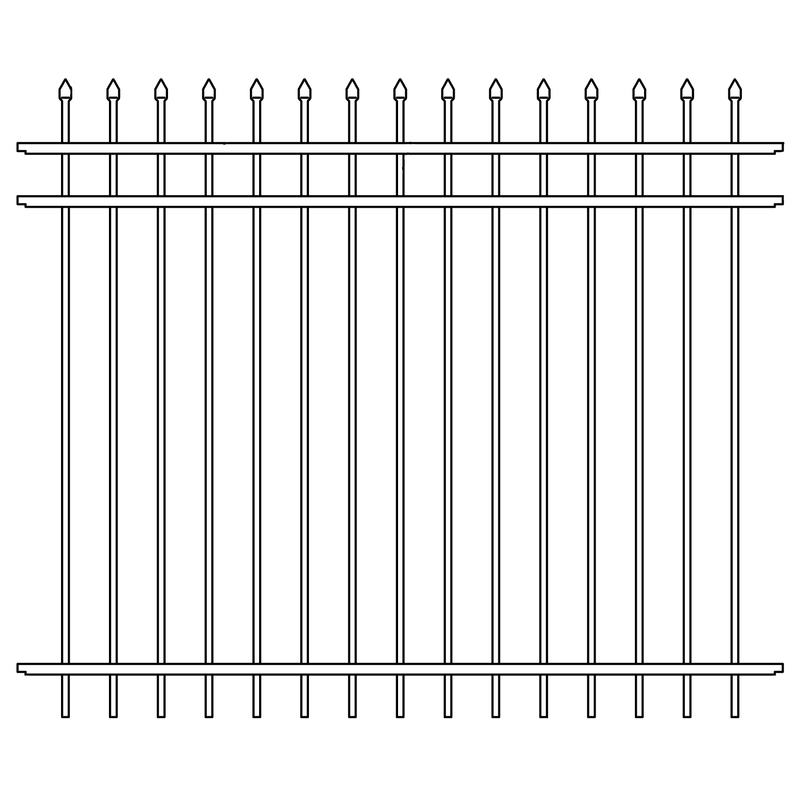 3ft Tall x 8ft Wide Economy style iron fence panel with pinch tip pickets instead of welded on finials. Features 2 horizontal rails. Fence hardware and steel posts not included, but are available for purchase. Matching walk gates in 3.5ft, and 5ft single widths as well as 7ft and 10ft double widths available as well. Discontinued from regular inventory. 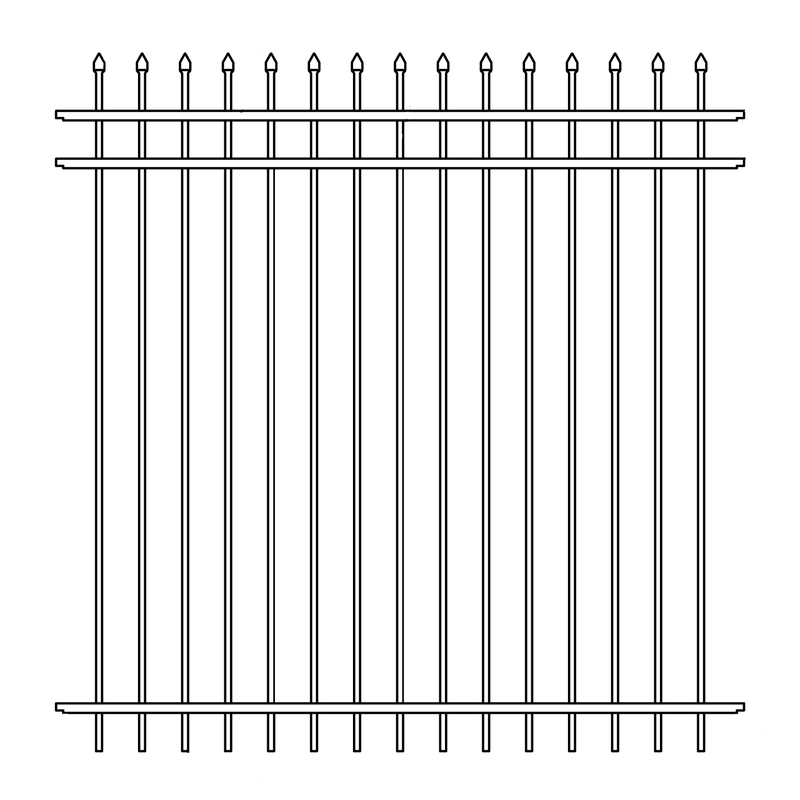 6ft Tall x 6ft Wide Economy style aluminum fence panel with pinch tip pickets instead of welded on finials. Features 3 horizontal rails. Requires Style #1 Classic aluminum posts and hardware. Hardware and posts not included. Matching walk gates in 4ft, 5ft, and 6ft single widths as well as 8ft, 10ft and 12ft double widths available as well. Discontinued from regular inventory. 5ft Tall x 6ft Wide Economy style aluminum fence panel with pinch tip pickets instead of welded on finials. Features 3 horizontal rails. Requires Style #1 Classic aluminum posts and hardware. Hardware and posts not included. Matching walk gates in 4ft, 5ft, and 6ft single widths as well as 8ft, 10ft and 12ft double widths available as well. Discontinued from regular inventory. 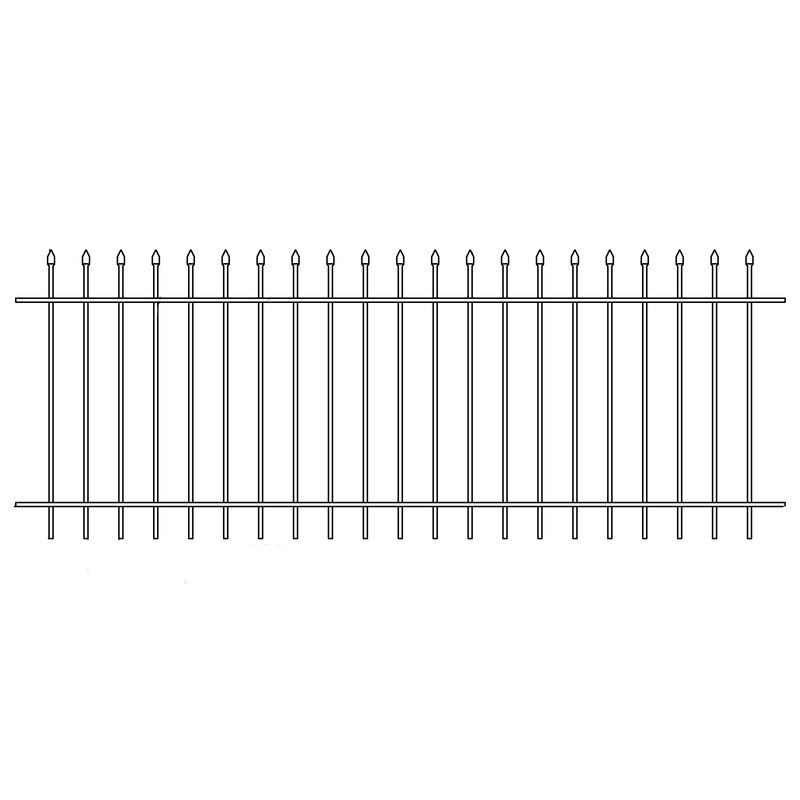 3ft Tall x 6ft Wide Economy style aluminum fence panel with pinch tip pickets instead of welded on finials. Features 3 horizontal rails. Requires Style #1 Classic aluminum posts and hardware. Hardware and posts not included. Matching walk gates in 3.5ft, and 5ft single widths as well as 7ft and 10ft double widths available as well. Discontinued from regular inventory. 6ft Tall (6'6" at arch top) x 44” Wide Classic Style Arched Iron Walk Gate with open bottom frame design. Latch/ Hinge Hardware and posts not included. Discontinued from regular inventory. 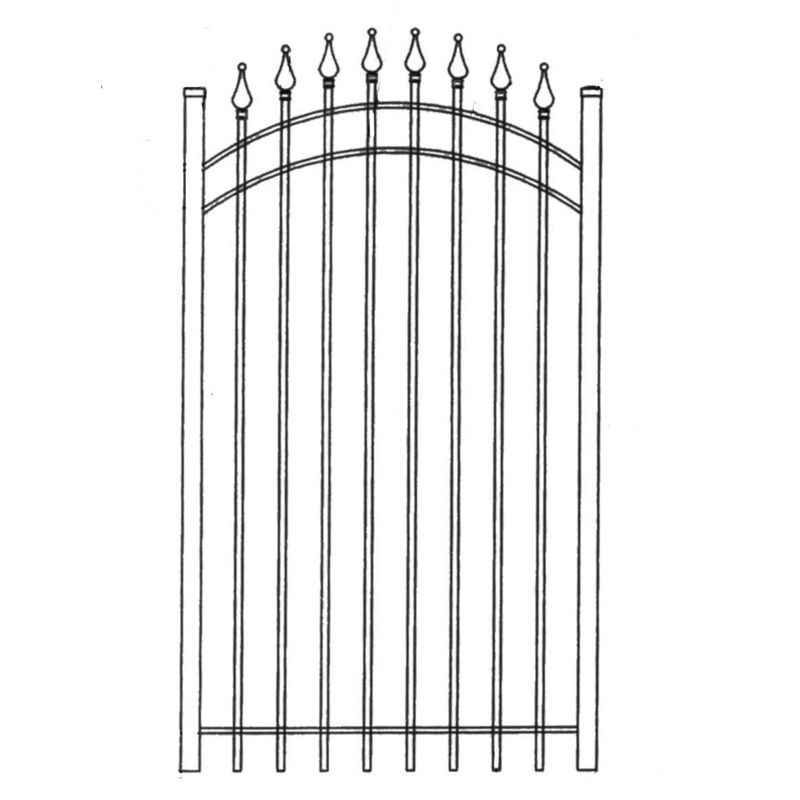 4ft Tall x 6ft Wide Economy style aluminum fence panel with pinch tip pickets instead of welded on finials. Features 3 horizontal rails. Requires Style #1 Classic aluminum posts and hardware. Hardware and posts not included. Matching walk gates in 4ft, 5ft, and 6ft single widths as well as 8ft, 10ft and 12ft double widths available as well.